Our 5 Berth 2016 Roller Team T-Line 740 Motorhome PROVIDES YOU the perfect balance of comfort, luxury & technology. 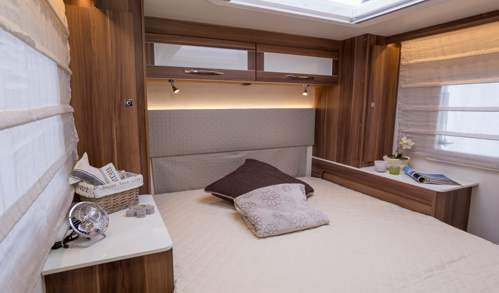 the design, attention to detail and functionality of the accessories and fittings make this luxury Motorhome the perfect choice. Well appointed L shaped kitchen with sink. 3 burner hob with glass folding cover. LED lighting under workshops and kitchen area, full drawers and storage cupboards all soft close with positive catches. A large slim fridge freezer ideal for taking the family away for all those essential items. Double fixed bed to rear. Adjustable table that coverts to a single bed. L Shaped dinette with comfortable seating, storage pockets and USB port conveniently positioned. Large dinette table, fully adjustable to be folded away and moved easily. basin and separate shower cubicle. 6000 watt combined gas heating. BASED ON TH FIAT DUCATO 35, 130HP, MANUAL GEARBOX. 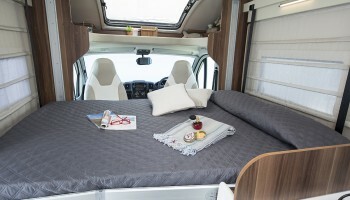 DISCOVER A NEW WAY OF EXPERIENCING YOUR LEISURE TIME IN THE T-LINE 740 SLEEPS UP TO 5 PEOPLE WITH THE DROP DOWN BED, AND SEATING CONFIGURES IN TO A single bed, DOUBLE bed to the rear. THE KITCHEN HAS A FULL SIZE FRIDGE FREEZER, 3 RING GAS HOB, AND A GAS OVEN AND GRILL. ALL YOUR COOKING UTENSILS ARE INCLUDED WITH THE HIRE.